Submitted by herbatic on May 19, 2008 - 4:31pm. you're not alone! In the state of South Australia, the most popular drink is 'Farmers Union Iced Coffee'. Cold, coffee-flavoured milk sold in a carton. It's even more popular than soft drink here! Submitted by General Specific on May 20, 2008 - 6:45am. Three fiddy? It was about that time that I realized the barrista was an 80 foot creature from the mesozoic era! Submitted by felonius on May 22, 2008 - 9:44am. I've lived my whole life within 20 minutes of Rhode Island, where Coffee Milk is the state drink (yeah... They even voted on it...). 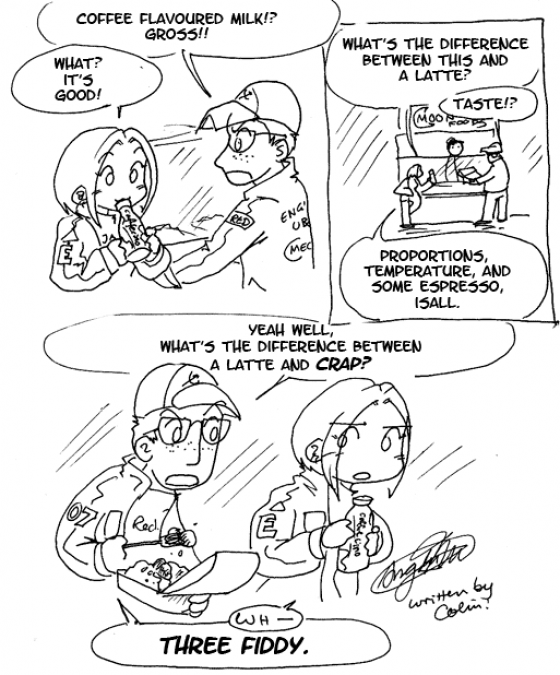 I have *always* loved coffee milk (and coffee ice cream... but sometimes I prefer Mocha). Submitted by Foot on January 19, 2009 - 7:01pm. I used to drink the chocolate 'milk to go's until I got all lactose intolerant-y. ...I blame the 'milk to go's for that. Submitted by ZekeStaright on March 11, 2009 - 7:04am. Submitted by Anonymous on June 29, 2009 - 9:15pm. Submitted by ConnorElzaim on November 6, 2009 - 11:57am. I often feel like the only student on my whole campus who does not consume coffee or coffee related products. Submitted by Serbian Goth on January 8, 2010 - 2:58pm. Submitted by MyDegeneration on May 7, 2010 - 9:15pm.